Enjoy brighter, smoother-looking skin anywhere you go with this travel-size skincare collection featuring Renewed Hope In A Jar and Renewed Hope In A Jar Eye. 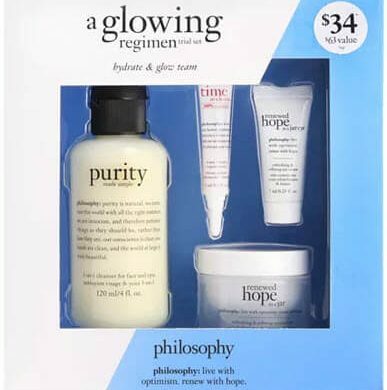 Philosophy skin labs’ original breakthrough Hope In A Jar formulas have been infused with a new innovation: clinically proven skin renewal technology that delivers immediate and constant renewal and hydration. Experience refined texture and pores, soft dewy smoothness and healthy color and glow with Renewed Hope for face and eyes. Paired with award-winning Purity Made Simple one-step cleanser, this collection offers complete care for the skin in a convenient and travel-ready size.